is the classic Ayurvedic oil massage that uses the skillful application of medicinal oils with specific nurturing strokes. It activates the energetic centers (Marma points), breaks up impurities, and stimulates arterial and lymphatic circulation. Perform by one or two practitioners, working in synchrony, upon request. is an herbal medicinal steam therapy that can be administered locally to specific body parts or for the entire physiology. (Except for the head, which is always kept cool). It allows oils to penetrate deeply into the tissues and also removes toxins. is the pouring of medicinal liquids (oil, buttermilk, ghee) across the forehead. It specifically nurtures the region of the third eye, connected to the master gland of the body, the pituitary and it also creates a profound sense of peace and calm. 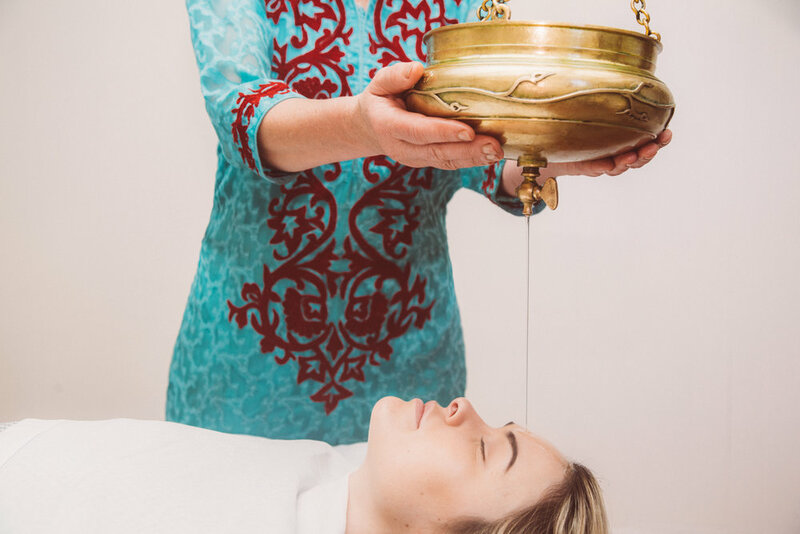 is a study of the fundamental principles of Marma Therapy and how to use sound, touch, aroma, and intention to direct the flow of prana for healing. Learn about the SVA Marma system and study Marma as taught by Vaidya R.K. Mishra, for self care and for clinical practice. is a brisk massage that uses herbal powders and pastes to stimulate the release of toxins and supports the removal of excess fatty tissue. is the classic sinus and nasal treatment designed to open up the channels of the upper body to allow more pranic energy to enter. 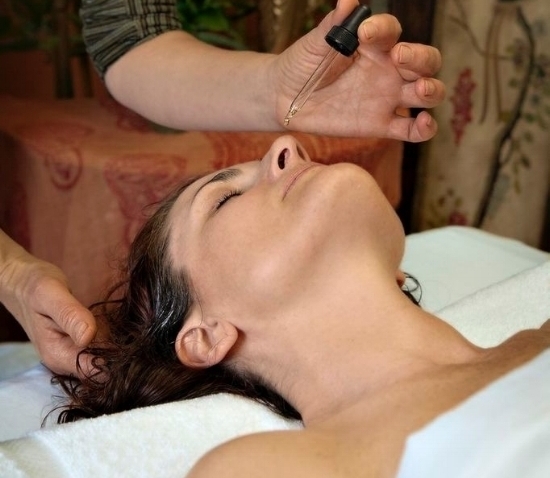 It includes an enlivening Indian head massage, localized steam, and the use of an assortment of nasal concoctions. involves the use of a variety of methods and techniques such as the bathing of the eyes in ghee, eye drops, and purification through herbal smoke to alleviate eye conditions. uses a specific ear massage and the application of herbal decoctions to relieve earaches and other ear related problems. Click on the video below to see Corinna in her Santa Barbara office, giving an Ayurvedic treatment to a client.